Hello all! Hope you all are having a wonderful day. It sure has been a gorgeous week here in my town. I've been very busy this week trying to keep up with my to do list of design deadlines, running errands and visiting friends. Anyways, I've got some Hero Arts and Papertrey Ink goodness to share with you today... Thought this color combo of Lemon Tart & Raspberry Fizz (which I am loving) would be fitting for the summery weather we have been having this week. 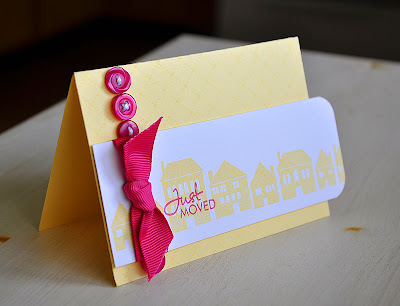 Started off by stamping Row Of Houses, in Lemon Tart, across the white cardstock strip. 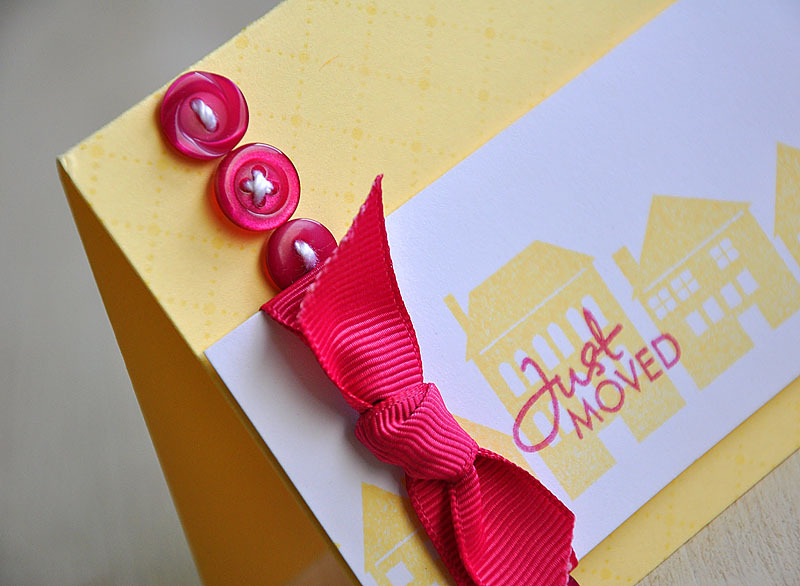 Wrapped with Raspberry Fizz grosgrain ribbon, stamped a sentiment from Boards & Beams and rounded the corners. Attached the strip to a lemon tart card base, which measures 5" x 3.5". I made sure to trim enough off of the base so that, the stamped house strip could hang over the edge and still fit into a regular sized envelope. Stamped the card base with Background Basics: Tin Type in Versamark ink and finished it of with a row of Raspberry Fizz buttons. Well, I'm off to get crafty! Thanks for visiting today! I just adore this card! It is just simply gorgeous! Gorgeous, Maile! I love the color combo! Oh MAILE, this is just DARLING!!! Love the yellow and raspberry together! So clean and simple. I just love that. Gorgeous and sunshiney! What a great color combo! Love your row of buttons and awesome color scheme! Great card! love it Maile..the colors are fab! Love the colors and layout and concept and buttons and...well, it just rocks. Thanks for the inspiration! Love the color combo :) Have to try that one sometime! What a festival of stamping simplicity and design brilliance! Wahoooo! So lovely, I would have never thought to stamp these house images in yellow, but your card looks stunning in this lighter shade, love it! love the subtle background! beautiful card! love the fab design as always! !